Have you been loving the warmer fall temperatures as much as we have? It nice when fall behaves and has a gradual decrease in temperature, instead of cliff diving right into the 40’s…amirght?? The 40’s will be here before we know it, so now is the time to start making sure your pond will be ready for winter. 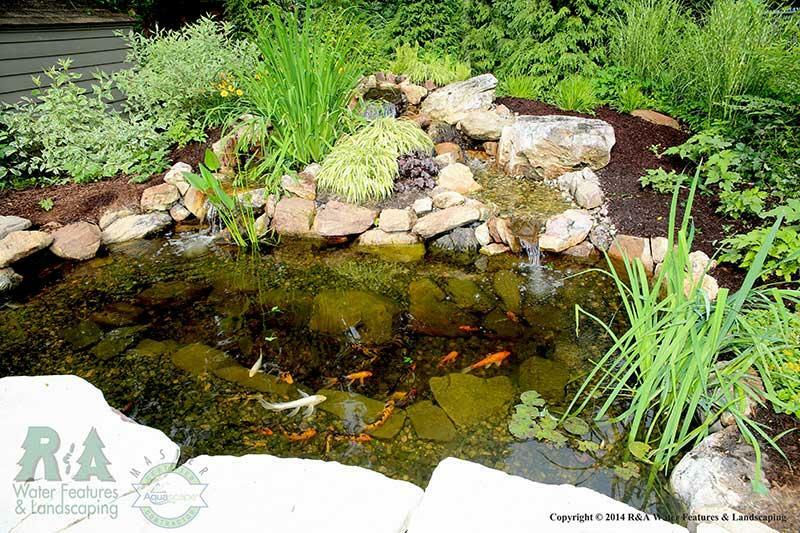 Many of our new pond owners have questions about what they need to do to winterize their Kalamazoo koi pond and what additional products they may need. One of the most important winter products for you pond is a pond aerator. And if you’ve heard the term ‘Pond Aerator’ or ‘Pond Aeration’ before, you may have wondered what a pond aerator is and how it works. This will be quick, but a simple refresher in the nitrogen cycle will really help any pond owner. You feed your fish. Fish digest food. Fish waste and excess food fall to the pond bottom. Plants absorb C02 & use some fallen waste for their food. Plants release oxygen in return. Good bacteria (that depend on oxygen to function) will fight and eat ammonia (kind of like a superhero fights villians). NITRATES are much safer for fish, and are used by plants for food. Nitrates are removed via water changes. 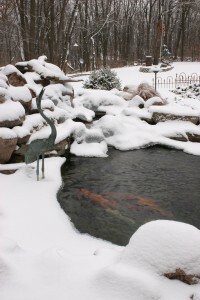 What happens to your pond in winter? Your waterfall is turned off, pond plants are removed or have gone dormant, and a layer of ice forms over the top, right? That waterfall consists of moving water, which provides a lot of oxygen to your pond, and those plants can’t release oxygen either. Every process in your pond depends on oxygen, your fish need oxygen to survive and the beneficial bacteria rely on oxygen to keep your Kalamazoo pond healthy. Yet the nitrogen cycle continues, even though your fish have gone into a semi-hibernation state, and there is no oxygen circulation throughout your pond. With a sheet of ice over your pond, your fish are trapped in water with ammonia and other deadly gases, which can prove to be lethal for your fish friends. This is where a pond aerator steps in, helping to save the day…and your fish. A pond aerator releases a column of bubbles that will help keep a hole open in the ice, for needed oxygenation, and helping remove the harmful trapped gases from the water. Our pond aerators have a weather-proof, energy efficient, 45-watt air pump and come with one large 8″ diameter aeration disk that attaches to the air pump through a 30′ long braided aeration tube. Our pond aerators can be used in ponds up to 10,000 gallons, and can be used during the rest of the year as well, which we recommend . So there you have it, a quick re-cap in science will help you understand more about how your Kalamazoo ecosystem pond functions and what is needed (and not) to keep it healthy. We stock our pond aerators year round, and highly recommend having us install one in your pond, especially if you have fish. If you have additional questions you can find answers to some common questions or contact us today to get your pond aerator installed.